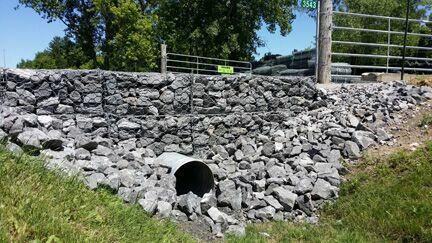 Double twisted hexagonal wire gabions and reno mattresses have been used for channel linings, river bank restoration, soil retention, slope stabilization, and other applications successfully throughout the world for over 100 years. Our standard PVC coated, galvanized gabion baskets are constructed of 3-mm or 4-mm steel wire - either woven or welded, depending on strength required. We stock all standard PVC coated gabion sizes: 1m high by 1 m deep, and either 2m, 3m, or 4m long, as well as 0.3m and 0.5m high. Gabions offer many advantages over similar construction. In addition to standard PVC coated gabion basket sizes, we also offer an exclusive line of Mini Gabions, available in standard 2 m, 3 m, and 4 m lengths, measuring 0.5 m high by 0.5 m deep. These economical alternatives offer greater design flexibility while reducing environmental impact and excavation and installation costs.